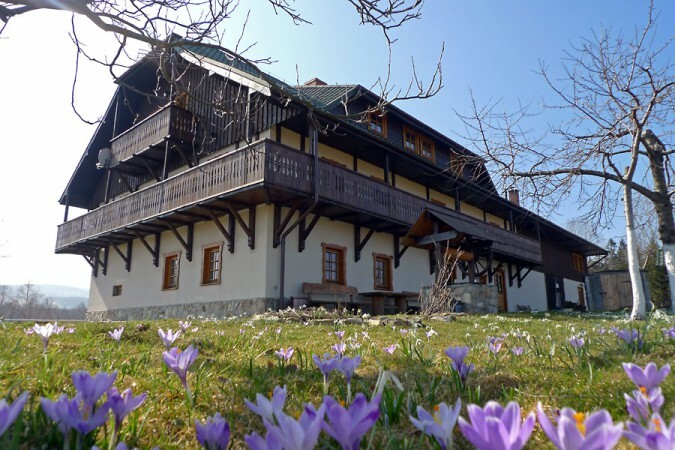 Just at the entrance to the village of Mlądz, 7 kilometres from the well-known Świeradów Zdrój resort and 25 kilometres from Szklarska Poręba, a detached house stands surrounded by lovely flowery meadows and forests, with a stunning window view over the Jizera Mountains. The area is considered to be one of the last bastions of peace and quiet, where the routes are not crowded and one can still enjoy the magic of unspoiled nature. The rooms inside are spacious and full of sunlight. Wooden floors and a variety of wooden ornamental elements make the house warm and cozy. For the comfort of our guests the following spacious double rooms with a kitchen are available: “The Orchard Room”, “The Meadow Room” and “The Sunny Room”. In addition to this there is also “The Grandma’s Room” with a kitchen annex as well as “The Little Lavender Suite” including a bedroom and a small living room. Each room is an en suite with a shower and a TV set. There are balconies in three of them. The kitchen and the kitchen annex are fully equipped. What is more, our guests can enjoy the comfort of the lounge and internet access within the entire house. Our guests can use the kitchen or order breakfast and dinner. Children can enjoy a nearby mini-playground. The nearest peak of the Jizera Mountains is Stóg Izerski (1107 m.). It can be reached along the trek route or by Gondola cableway from Świeradów Zdrój. Undoubtedly one of the main attractions is also the network of bicycle trails. The winter time invites you to enjoy cross-country skiing virtually from the doorstep of the house. The enthusiasts of downhill skiing will love the illuminated ski slope in Świeradów Zdrój.